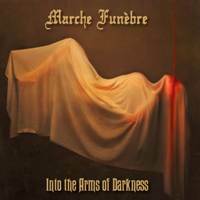 Since their inception in 2008, Marche Funèbre put themselves on the international doom metal map step by step. After ’To Drown’ (2011) and ‘Roots Of Grief’ (2013), recently their third studio album was released. Since ‘Into The Arms Of Darkness’ happens to be a recommended disc for every fan of intense doom metal – on top of that produced by Markus Stock (Schwadorf – Empyrium, The Vision Bleak) at his famous Studio E – and we like to cherish this embrace of darkness, we organized a conversation with vocalist Arne Vandenhoeck for an upgrade of things that happened since their previous album and former interview. Arne, the previous album ‘Roots Of Grief’ came out in September 2013. What happened next to Marche Funèbre? Well, we could start right away with a couple of cool shows when that album was released. I think of Darken The Moon IV with Ahab and Mourning Beloveth. Right after that we did our first small tour in the UK, early 2014. Since then we have done around fifty gigs, in Belgium and abroad. Darken The Moon V took place in Brussels, with Saturnus and Thurisaz, but actually it was part of our tour with Eye Of Solitude. With Eye Of Solitude we have shared the stage many times now. We have toured four days in four different countries right before Darken The Moon V. In the meantime we made recordings in 2015 for our 7 inch vinyl single ‘Lost’. Ah wasn’t that the first try out with producer Markus Stock? Indeed. We went to Germany to Markus then. That was an idea from one of the guys. As a matter of facts, right after the release of ‘Roots Of Grief’ we had the feeling that we did not handle the recordings to the max. We had chosen a studio in Mechelen, where we live, that was easy and Cantar once recorded their masterpiece over there, Steak Number Eight had been there… anyways some mainstream bands like Bart Peeters and Milo did their thing there. However you need a top producer over there, one we could not afford. We have taken the chance, but lost in this case. But we learned a lot from that experience, even though it frightened us as well. Most of the songs we release now are written in 2014-2015. We had six songs, one of them did not really fit the rest – music-wise and lyrical – more death metal, really heavy, short song called ‘Lost In The House Of Doom’. That’s the one we decided to record with Markus Stock to see if things would work out and the click was there. We also had a kind of favourite from the fans ‘As In Autumn’ which we wanted to give a second try. We play it live with a shorter intro now and the song has grown since we recorded it for ‘Roots Of Grief’. That was the second song we recorded in Germany for the single as B side with Markus. This was a marvelous experience! It is a nice guy and professional, isn’t he? Well yeah, you have been knowing him for quite a long time. In the meantime we know him pretty well too. From the very outset it was amazing to work with him. He knows everything! He is guitarist, bassist, drummer, producer, engineer, master,… And he is not more expensive than the studio right behind the corner. The only issue one can mention is the distance. Okay, you have to drive to Germany, but that’s part of the adventure. Another issue one might mention is the language. It was the first time we recorded with someone who does not speak Flemish. On the other hand, our speaking language within the band happens to be English. Bassist Boris is French speaking and we are Dutch speaking, but we communicate best in English. Since we have done quite some tours with all kinds of nationalities, you grow into the matter of taking English as main language on the road. And beyond. So that was not the problem either. We have done a preproduction demo of both songs for the single and worked it out with Markus. Same thing we did with the five songs for the new album, the ones that musically, stylistically and thematically belonged to each other, at least in our opinions. We recorded the drums with Bob, a guy we know for a long time and prepared and recorded our parts at home as foundation for the real recordings. Everybody was really focused and prepared. I think I was the one who did not prepare himself that well, because right before the recordings I was on tour with Inverloch. Yes indeed, that was something taking me by surprise! Suddenly you were the live front man of them. How did you manage to do that on short notice? One year ago I got a mail from them. I know the drummer. I am not so familiar with the material of Disembowelment, it is before my time… they are cult, really echelons of heavy ponderous doom. These guys were looking for a singer, I was sitting at home and I was in the mood for an adventure. Well, I was honoured as well of course. So I took the challenge. I could play at Roadburn, doing a tour of ten days in eight different countries, this is an offer you cannot refuse. Well, the last day of that tour was 23rd of April and on the 25th we should go to Markus to record. Our last gig was in Portugal, so I had to fly home on the 24th… I was broken. Fortunately my voice was not broken, but my body was a wreck. Fortunately the vocals are the last in line, so I could recover before it was my time for action. The studio is in the middle of nature, so we had the opportunity to come to tranquility. Markus is totally busy with music on emotive base, that’s the way we approach music as well. That’s why the bond was a success from the very start. As you said, the five songs have a common thematic subject, as well as musically. Can we see a kind of concept? No, we mostly work with a kind of coordinated basic word. That’s something we make out for ourselves. At the first album it happened to be ‘water’, because we had a lot of metaphors dealing with water. ‘Lethe’ happens to be the river of oblivion. ‘Valley Of Tears’ goes in the same direction. On the second album the theme dealt with trees (laughs). You can see that on the cover art as well. Now the main word happened to be ‘darkness’. In every lyric there is another aspect of darkness and what it represents for us. In the first song there is darkness when something cruel and terrible happens in your personal life, the second lyric is more the kind of darkness of a depression, the third lyric is the darkness of only thinking in black and white… that’s more philosophical… well, you often see this, only watch the news and you hear people saying: it is good or bad. There is no twilight zone anymore. The fourth lyric deals with finding peace instead of fighting the demons in your head. The fifth lyric is a dark love story in the vein of ‘Murder Ballads’. But no concept. With ‘Roots Of Grief’ five out of the seven songs had a common theme, now that’s not the case. I hear that from many people. It feels more natural indeed now. I can only say that I possibly improved by singing the songs of ‘Roots Of Grief’ live, daring to do this and being encouraged by the other members of the band. In this respect it was possible to expand this talent, which was most likely inside me. After the first CD I thought it was better to stop doing clean vocals, because the reactions were cruel. That’s not so funny, acquired taste you know. We like to focus on the exceptional video clip you have shot for ‘Lullaby Of Insanity’. That’s ace, at the old castle. How did you manage to do that? We are very pleased with it. Firstly we brainwashed about which song would be fitting to be caught in visual exposure. The metaphors of the first song deal with space, the sun… quite difficult. Second song: rain… hmm… Third song has no metaphors you can transfer into visual aspects either. With ‘Lullaby Of Insanity’ we had instantly the feeling we could do something about it. Earlier we had made a clip for ‘Crown Of Hope’ back in the days and we are still satisfied with it. Then we went for extra footage and the band that plays. But that’s not enough for a fifteen minutes song. We looked for atmosphere and an interesting location. We finally settled down in our neighbourhood at Castle De Borght in Mechelen. Normally it is not a public site, but we managed to have connections and finally with great respect for the artifacts we shot our video over there. We first got the confirmation that we were allowed to film at the site and finally they wanted to open the door and we could make an amazing clip. We are very thankful for this experience! We had get to know somebody who does video montage and we feel that this woman is very accomplished. She did the cutting. She did it with the feel of love. The fact that the video appeared to be ready before the release of the album was very fine and important. That’s how we started the promo campaign of our new record. For mankind, the songs are new, but we tried them out for the first time live in October 2015. That was a conscious try-out before we got into pre-production. At the moment we are used to play two or three new songs live. But we are very honoured to share the stage with Primordial. Some people told us it is not really doom metal, but that’s not what our Fest is about. It is giving us a platform to play with bands that we love. That is the most important thing. Like Nailed To Obscurity, they go for it all the way. This band is really promising. 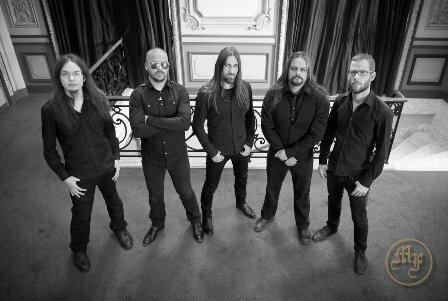 And Primordial… they rule! I hope this time the venue will be sold out! And we have booked an extra show with Primordial in the Netherlands on the 24th of March in Willemeen, Arnhem. I am pretty confident that the shows will be sold out! We will meet at Darken The Moon VII! Thank you for your time, Arne.